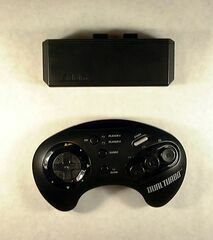 The Dual Turbo is a set of wireless control pads for the Sega Mega Drive by Acclaim. The pack contains two control pads (with turbo options) and a receiver. A similar bundle is available for the Super Nintendo.